Gluten free. GMO free corn. Suitable for Vegetarians and Vegans. Recipe No.63 We wanted a chip that celebrated our love of Latin America - it took 63 batches to uncover the lively trio that combines the ancient grain of the Andes with the vibrant tastes of Mexico and Peru. The Deliciousness is all in the Detail. Shape: this generously sized 'Totopo' Triangle is extra large to fit in all our favourite flavours from Latin America. Texture: finest White corn masa, rested then Gently Toasted for a light bite that gives way to the distinctive Crispness of roasted red and white quinoa. Taste: the Amarillo is the much loved chilli of Peru, bringing a distinctive fresh and aromatic heat that yields to the fruity sharpness of the Mexican Green Tomato. Savour: crumble onto an avocado and tomato salad or enjoy with Guacamole or salsa verde. Recipe No. 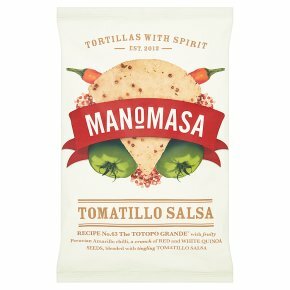 63 the Totopo Grande* with fruity Peruvian Amarillo chilli, a crunch of Red and White Quinoa Seeds, blended with tingling Tomatillo Salsa *The tortilla image shown is a visual representation and not actual size.